« Dental Bridge or Implant? If you have traditional (removable) dentures and struggle with the way they fit or feel, you are not alone. Many patients not only have to suffer from an uncomfortable set of teeth, but they end up restricting their eating habits and even their facial expressions due to the fear of their dentures slipping. That’s no way to live – especially when there is a solution! It helps to understand why your dentures are failing to provide the stability, comfort and confidence you had hoped for. There is a primary reason why patients experience a multitude of denture woes. Traditional dentures replace missing teeth, but they do not replace the roots of the teeth that once existed. This is important because without the tooth root, the jaw and gum ridge fails to retain its form and your bite force is drastically reduced. In fact, denture-wearers may experience a reduced bite force by as much as 75%! 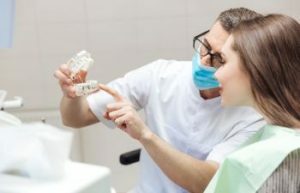 When it comes to progressive bone loss that occurs without the stimulation of a tooth root, patients may find that their dentures begin to slip more as the mouth remodels. The reliance of denture adhesives becomes an issue, and it is common for patients to restrain their facial muscles in an attempt to keep their dentures in place. The freedom to laugh and smile without inhibition can be lost. When bite force is reduced and denture slippage is a problem, a patient’s diet is almost always affected – in a negative way. They may rely on softer foods, which end up being high in carbohydrates and fat and low in fiber and protein. This can lead to diabetes, obesity and other medical conditions long term. Don’t worry – dental implants have given denture wearers hope. Using just a few dental implants, we can stabilize your denture to allow it to function more like your real teeth. Your jaw can be stimulated and you can avoid the fear of your dentures slipping when eating, talking or laughing. Protect your quality of life and your overall health and consider implant-supported dentures with Dr. Wayne Suway! This entry was posted on Thursday, September 13th, 2018 at 1:39 pm	and is filed under Dental Implants, Dentures. You can follow any responses to this entry through the RSS 2.0 feed. Both comments and pings are currently closed. Dr. Wayne G. Suway's dental implant practice serves patients from throughout the Atlanta Metro Area including East Cobb, Marietta, Smyrna, Vinings and the surrounding areas.